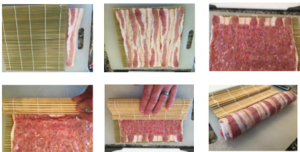 A fun and hands-on BBQ Sushi Roll recipe by Pit Buddies BBQ! 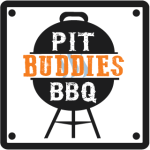 Visit Pit Buddies BBQ website. Using the bamboo sushi roller, cut bacon to about 9/10 of the sushi roller. Lay the bacon on the sushi roller. Try not to leave any gaps in the bacon layer. Make a thin layer of uncooked breakfast sausage over the bacon, leaving about 1/2 inch of bacon exposed on one end. The exposed end will be the bottom of the roll and should be furthest away from you. Lay strips of cheese, jalapeno, and red onion about 1/4 inch from the left and right edge. Make sure these ingredients are lined up as tightly as possible. Use only enough to make one strip across the roll. There will be leftover cheese, jalapeno, and red onion. Begin rolling the bamboo around the cheese and vegetables. Roll as tight as possible. Tuck the bamboo under itself to tightly form the roll. Pull the bamboo up and continue rolling it up. Light charcoal in the Hasty-Bake Charcoal Grill. Once the temperature is stable at 325°-350°, put a few chunks of smoking wood (apple, hickory, oak, pecan, cherry pair well with pork) on the coals. Place the BBQ sushi roll directly on the grill grates. Rotate the sushi roll in 5-7 minute increments until the bacon crisps. Brush on BBQ sauce during the final 5-10 minutes of cooking. Once the sauce has set, take the sushi roll off the Hasty-Bake Charcoal Grill and allow it to rest for 5-10 minutes. Slice and serve!